The giggles and anticipation of small children are always a vision to treasure. It is amazing to see how the little ones can bring most people – young and especially old – to smile, when they may otherwise not do so. Residents of Edgewood Manor of Lucasville, have for all intents and purposes, adopted Northwest Head Start kids. 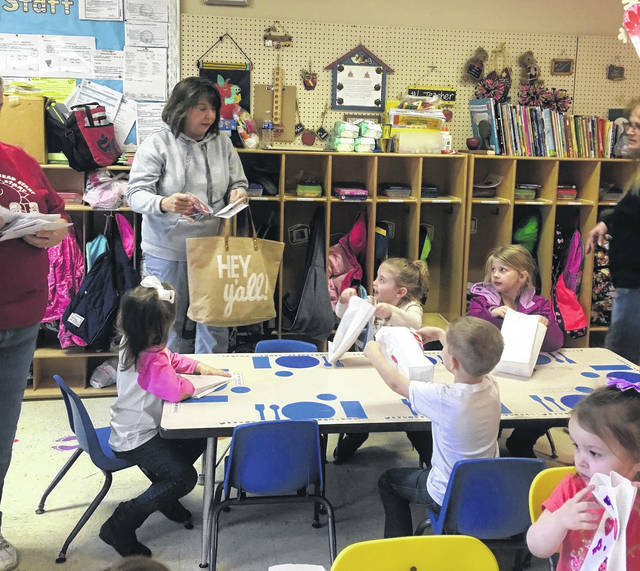 “They come over once a month and do crafts with the our kids,” says Northwest Head Start Teacher, Carol Cooper. How ever this all started, the kids at the Head Start, seem to totally enjoy whatever the residents do for them. There was a bit of disappointment on Valentine’s Day, however. Due to the rain and bad weather, the Edgewood residents could not come out and personally deliver Valentines to the children. The kids were told by their teacher and some were disappointed, but once Cooper told them that they were being delivered by the activity director and that there would be candy, too, everyone was once again, happy. The residents visited the Head Start last week and helped the kids decorate their Valentine Bags. And, those little ones did not hesitate a moment to show off what they had made. 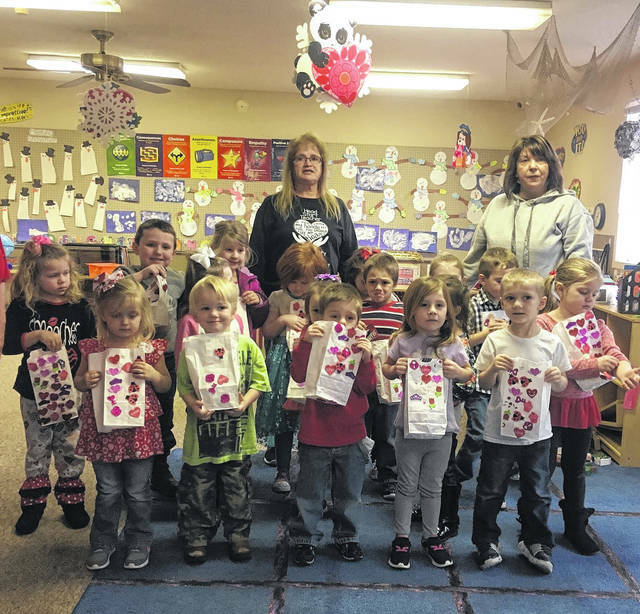 Then, when Edgewood activities director Janell Hiles brought the Valentine’s that the residents had made and personally signed for each child, (as well as the promised candy), the little ones were just as excited, as if it were Christmas. One of the little girls, dressed in all pink and red, said out loud, “This is the best thing ever!” As the others all began opening their cards, made just for them, you could hear things like, “Look, look at mine! I love it,! Pretty!” and more. There was one little girl who appeared to be quite shy, sitting by herself and who had not yet opened her Valentine. She finally and quietly opened her decorated bag without saying a word. The smile that came across her face was worth a million words. Hiles says the residents will ;participate in an Easter egg hunt with the two groups in March at Bear Lake, which is beside Edgewood. She says the Edgewood residents love to hide the eggs (of which Hiles says are over 500) and then watch the children find the eggs they have hidden. What joy this must bring to one and all! Hiles says the residents and kids have a good relationship with each other and that there is one special woman the children all call grandma and all want to sit in her lap. Kids bring out the best in all of us. They do not judge by what you wear, how you dress, how you look or any other manner. They just bring love. What better way to celebrate Valentine’s Day, the day of love, than to share it with those little ones and their hears bursting with love.